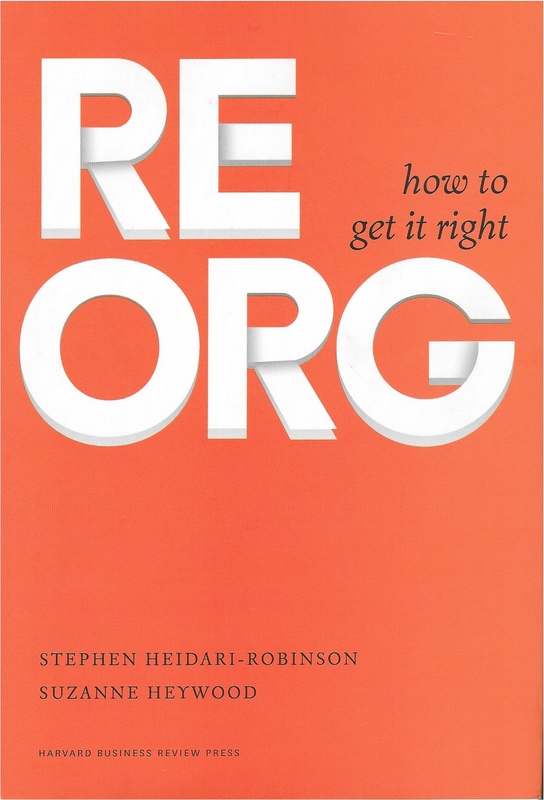 A reorg is like any other business problem, so you need to understand the benefits, risks, time and effort before proceeding. • Reorg(anisation)s can be a good way to unlock latent value in companies, but everyone hates them. They create anxiety and fear amongst employees and distract them from their day-to-day jobs. • Two former leaders of McKinsey’s Organization Practice present their 5 steps based on 25 years of experience and research with over 2,500 executives who have been through reorgs. Often the benefits are ill defined, with no consideration of resources required and no agreed timeline. You need to explicitly define the value (or don’t do a reorg), identify costs and risks, and set an accelerated timeline. Often people only concentrate on weaknesses, and only listen to leaders and hearsay. Proper analysis and listening to all staff gives a fuller picture, often highlighting strengths to capitalise on and increase revenue. Often companies skip the first two steps, impose one generic solution, and focus on org charts (avoiding difficult leaders who resist). Instead, explore different options and have the tough leadership debate at the beginning. Long, evolutionary planning doesn’t work, nor does leaving leaders in old positions to resist change, or trying to change everything. Better to plan in parallel, implement change as a revolution, give leaders a stake in the new organisation, identify the 80% to change, and do that in 100% detail. It’s no good only measuring inputs, letting issues fester, or going back to business as usual. Better to measure outputs, conduct a 5,000-mile check, capture the lessons and change ways of working to adjust. • 70% of reorgs deliver some value, but only 16% deliver the results they were supposed to in the time they were supposed to. The main reasons are: employees resisting or leaving, insufficient resources, distraction from day-to-day work, leaders resisting, or the org chart changes but the way people work stays the same. • In most reorgs, only 20-30% of the organisation changes. The knack is identifying which bit – usually to be found where what leaders think is broken intersects with what really matters in the business. • Communication of reorgs usually fails due to ivory-tower idealism (over enthusiastic leader thinking all will be well) or wait and see (keeping everything secret). • If the reorg team cost and likely business disruption exceeds the anticipated cost reduction or revenue increase, the reorg should not go ahead. • The timeline should be reverse engineered from the implementation date, and include two or three immovable deadlines. • The steps are fairly predictable, but points 1 and 3 are particularly poignant.